In response to massive online protest, Lamar Advertising agency refuses to apologize for discriminatory anti-Israel sign. A storm is brewing in the Windy City, as a massive anti-Israeli Chicago billboard has sparked a massive campaign calling for it to be taken down - but the advertising company adamantly refuses to apologize for the discriminatory sign. The billboard, posted on the major highway I-294 by the Lamar Advertising agency, directs motorists to visit stopfundingapartheid.org, a rabid anti-Israeli organization. In massive letters it calls to: "Boycott Israel Until Palestinians Have Equal Rights." In response to the blaring anti-Israeli sentiment a massive campaign has been launched, with many Jews and Israelis in particular posting one-star reviews of the Lamar Advertising agency's Facebook page. One Facebook user Uri Pilichowski on Thursday called on locals to call the company and protest, writing, "how do we get this taken down? Simple. If the billboard company, Lamar Advertising gets enough phone calls that it isn't worth it for them to keep it up, they'll take it down." "If everyone reading this would make a 30 second phone call (I'm sickened by your boycott Israel billboard, please remove it...) we'll make it impossible to do business and they'll remove it. Let's get it down before Shabbat," he wrote, adding the Lamar Advertising phone number at (225) 926-1000. The campaign is similar to the protest last November against Europe's largest department store, KaDeWe, over its decision to pull goods from Judea and Samaria. But while KaDeWe apologized for the move and retracted it, Lamar Advertisement remains adamant for now. In a post late Thursday, the company wrote on Facebook: "We have received a large number of social media comments and hundreds of telephone calls concerning a billboard in Chicago sponsored by the Seattle Mideast Awareness Campaign (SEAMAC). 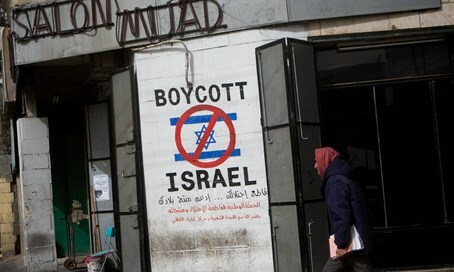 The advertisement suggests that people should 'Boycott Israel Until Palestinians Have Equal Rights.'" "It is important to understand that this is a message from SEAMAC and not Lamar Advertising," the company said, refusing to apologize. "Lamar has been in the billboard business for over 100 years and we have developed a strong commitment to supporting the First Amendment right of advertisers who wish to use our medium to promote legal products and services or to convey noncommercial messages such as the one in Chicago. We do not accept or reject copy based upon agreement or disagreement with the views presented. We think SEAMAC has a right to present their views and would also support the right of those who disagree with SEAMAC. We welcome your comments."